Treat yourself to a thrilling game on the reels with an Egyptian theme, high-paying gambling features and adventurous gameplay. We present Book of Ra Magic! 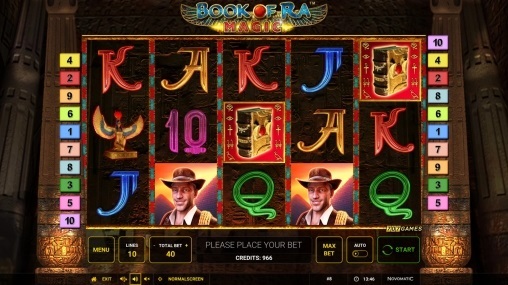 Book of Ra is one of the most popular games in the online slots industry. Novomatic is known for releasing exciting video versions of land-based slots. Years after being created, the mythological slot is a staple in most online casinos. The advent of Book of Ra Magic saw the release of Book of Ra Deluxe Slot and Book of Ra 6. You should check out the best online casinos to find out where to play. This slot might not be new but the story behind the gameplay remains ageless. The game is based on the true tales of an explorer who travels from America to Egypt in search of the ancient book. Have fun crossing the reels to Egyptian tombs and pyramids on this game. The user-interface is friendly and simple, perfectly designed against a sunny horizon and white sands. If you crave mythology, modern adventure and mysterious danger, this is the ideal online slot for you. The slot comes with 5 reels and 10 pay lines, all which are active on default. Expect to come across Egyptian symbols like gold statues, Scarabs, a grinning explorer and Tutenkhamen. There are also generic poker values in a distinctive hieroglyphic font. The Book is both a scatter and a wild symbol. The book can, therefore, replace all other symbols except the scatters. This symbol is independent of active lines and can form winning combinations at any cell. Play at maximum bets on all pay lines and land 5 explorer symbols to win a standard jackpot. If you get at least three scatters, you win a set of free spins. The more you play, the more chances you have of activating the free spins bonus. Land 3 or more Wild symbols on the reels and unlock 10 Free Spins. You also get an expanding wild that will fill up to 3 positions. The betting limits of this game are quite bankroller friendly. With a 1 – 900 coin bet range, you can be sure to enjoy this slot game even on a budget. In conclusion, the ancient-themed slot is stirring but the high volatility means longer ‘broke’ spells without any wins. However, wins are usually huge and worth the wait. Trigger the biggest win every time you land the explorer or 5 of these mythological books. Remember you only need a winning combination of 3 books to activate the bonus feature. Chase mystery and adventure under the hot sun of Egyptian deserts. This slot is for every player; high bankrollers and budget-gamblers alike. Book of Ra Magic is available on instant play via browser, so you do not have to download it. Even on smartphones and tablets, the model automatically redirects to a really user-friendly interface.